Supporting employees with a mental health problem can be a difficult time for both employer and employee, particularly if a member of staff has to take some time off work. Thankfully there are some fine resources freely available that can make managing this difficult period slightly easier for both parties. Such toolkits and documents have been carefully produced by respected organisations such as Business in the Community, Mind, and the CIPD. Business in the Community partnered with Public Health England to produce a free toolkit to help all businesses support the mental health and wellbeing of its employees. The toolkit aims to helps employers ‘take positive actions to build a culture that champions good mental health and provides a greater understanding of how to help those who need more support’. The CIPD worked with Mind, the mental health charity, to produce a mental health guide for managers to improve support for those experiencing mental ill health. 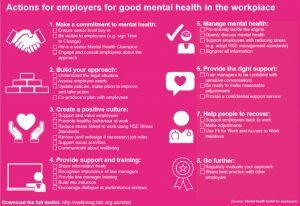 The guide sets out the practical steps that employers can take to create a mentally healthy workplace and help prevent poor mental well-being in the first place. It is designed to support anyone involved in managing people in workplaces, from line managers in large organisations to owner-managers of small firms. You can access the guide by clicking here. Independently, Mind has produced a very useful 15 page document entitled: How to support staff who are experiencing a mental health problem’ which can be accessed for free, here. Finally the website Mental Health at Work (curated by Mind and The Royal Foundation) website houses a number of resources which cover supporting employees with a mental health problem. These include guides, tips, podcasts, resources and videos with the main goal being improved workplace mental health. You can access it here.